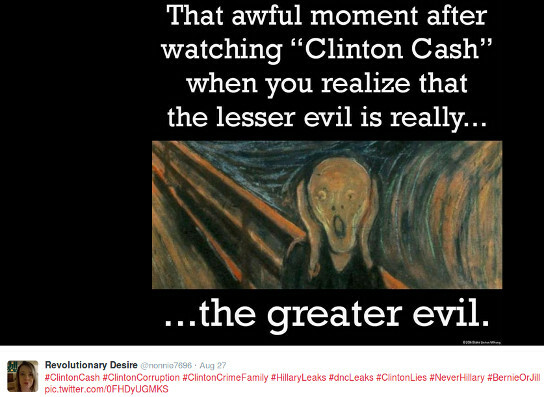 >> LesserEvil2016.com << Which candidate is biggest threat to peace and a war-monger? dangerously so, on Foreign Policy? To whom are the "War without end" Neocons flocking? Which candidate do warmonger Neocons fundraise for? 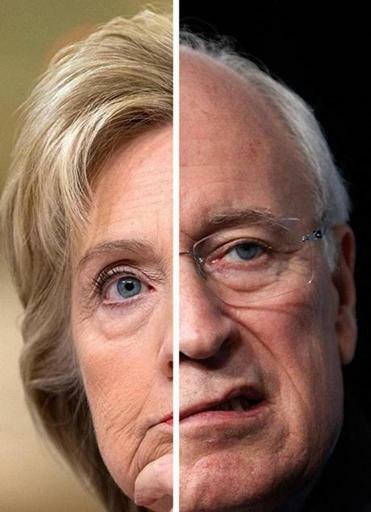 Hillary Clinton is "Cheney 2.0"
dead civilian men, dead women, dead children. Those children include school-age kids. Toddlers. Babies. No sugarcoating: That's who the Bush-Hillary Iraq War killed. 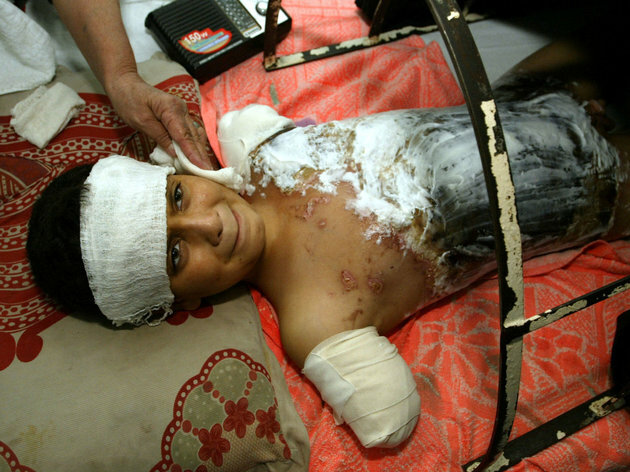 bombs funded with your & my taxes which could have funded something useful. They don't pay the bills, you pay in $$Trillions... and in lives. because they're 'Sensitive' "?? Ha! That's a joke. A sick "dead baby" joke. Neocons are not "sensitive people"
One thing these Neocons aren't is "sensitive". "is running to left of Hillary on Foreign Policy"
she is to the right of Republican DT! about how reactionary and how dangerous Hillary Clinton is. 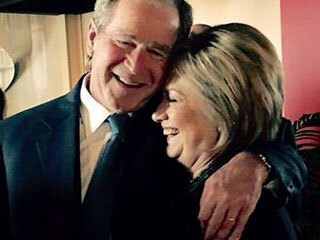 and how she's acted in office: Hillary is a Neocon running as a "Democrat"
Here she is with her dear friend, George Bush, who lied the U.S.
PTSD, or with other, often lifelong, debilitating health problems. 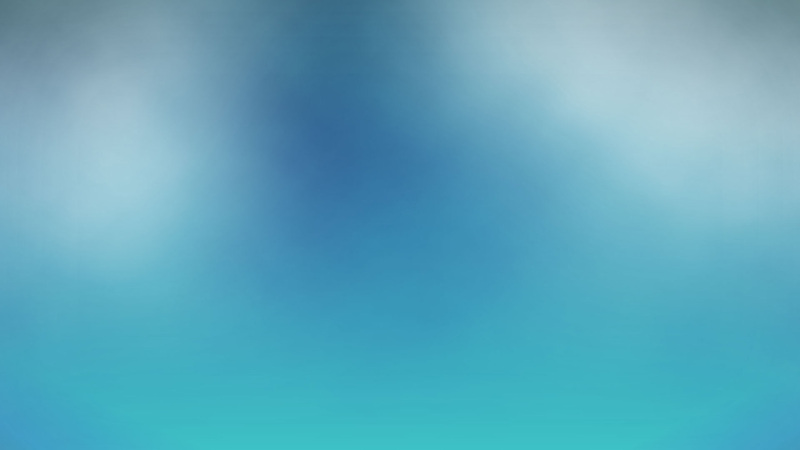 And even more — hundreds of thousands! — of dead innocent civilian Iraqis. Does that sound far-fetched? It's almost as "far-fetched"
even Reagan couldn't accomplish that. than Republican presidents, history shows. 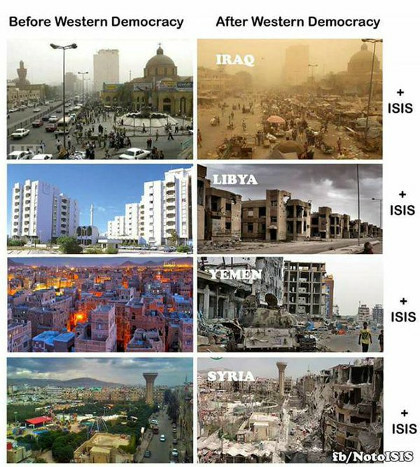 incredibly destructive foreign policy that makes us less safe. ...if the Democrat is corporate enough and neocon "enough". and even spearheded, demonstrates that's the case with her. 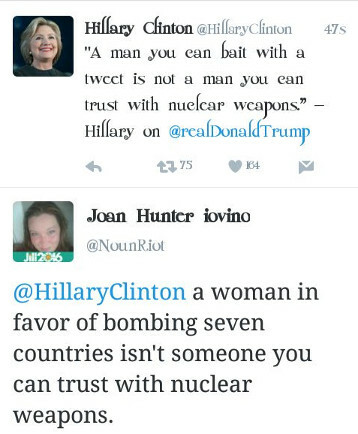 One twitter user made similar points to ours, that they didn't like Trump but that Clinton's trail of wars, occupations, bombings, thousands and thousands of dead civilians from the wars she voted for or even spearheaded (Libya) were more frightening. A second tweeted that the only reason Trump doesn't have the trail of dead civilians behind him that Hillary does is that he's never held office — as if this is an argument for voting for Hillary? That's like saying "the only reason person A never killed their wife is because they never got married, you fool!" 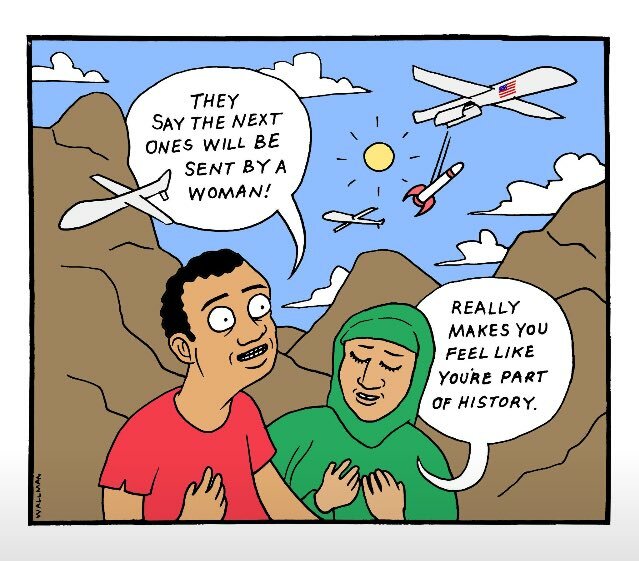 And then adding they will "marry" (vote for) person B — who killed their last four wives. Reality check: It doesn't make sense to excuse voting for Hillary by saying, "well, Hillary did those terrible things, but Trump might have done as bad or worse if he has been President..it's just that he hasn't"
That doesn't make sense on several fronts, one of which is that Hillary has been far more right-wing hawkish than Trump on Libya, Syria, even in confrontations with Russia. Trump didn't slash and end 60 years of aid to single moms, and so on (On Russia, progressive Arab-American Sam Husseini formerly with the progtressive media watch group FAIR, cited a scholar's analysis on how Hillary is far more hawkish than Trump on diplomacy/talks versus military confrontation with Russia. "Yeah, candidate A (Republcian) never killed a wife, but that's only because they never married. 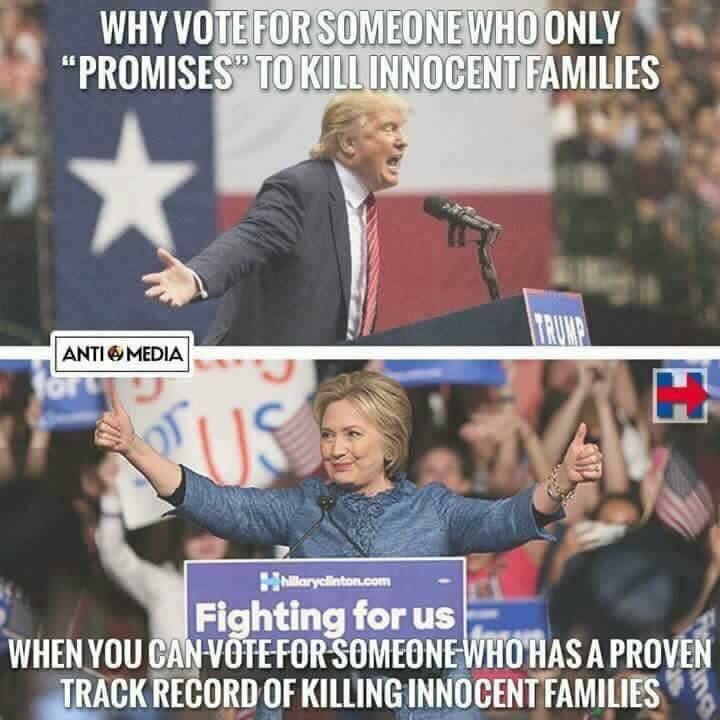 So I'm gonna vote for candidate B (HRC) who has a track record: they killed their last 3 wives, that's my choise for who to marry, I mean, for whom to vote for!" That's the fallacy the powerful interests want us to buy into without spelling it out.. 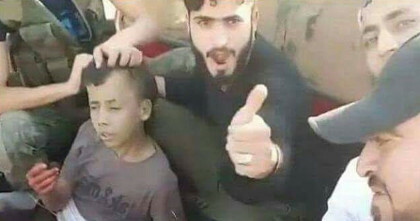 This group of so-called "moderate" rebels (in reality: violently extremist Jihadists) beheaded this twelve (12) year old boy! 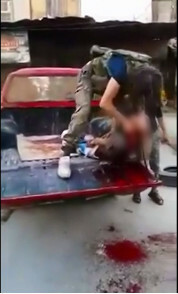 Welcome to the ugly truth: In Syria you don't have a simple equation of "ISIS and Al Qaeda are bad, the other, 'moderates' are good" Instead you have often admirable peaceful opposition groups but the overwhelming majority of armed groups are brutal, violent, civilian-targeting extremist Islamist jihadis and mercenary groups. 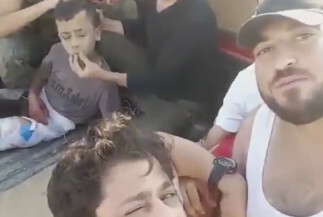 Back to these so-called "moderate" terrorist thugs: This very same group that beheaded the boy, wasn't just backed but funded (read: paid for by your tax-dollars) and not only backed by Hillary, but she has been to the Neocon hard-line Right end of spectrum (little wonder Neocons flock to her) and Hillary wants to double-down even further in support of vicious brutal jihadis trying not only to overthrow Syria's Secular government, and replace it with a strict Sharia Islamic State (with them as dictators, "naturally") but also terrorizing civilians and even beheading children. 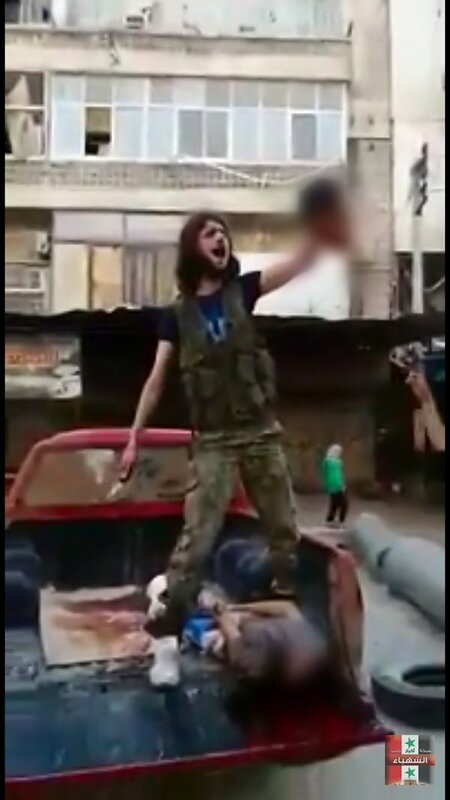 Just to be very clear, this is not ISIS or Al Qaeda, but "moderates" Hillary was most hawkish in supporting and who wants to escalate further. The last image is blurred but they are still very disturbing. You choice whether to look but it's you tax dollars, isn't there a moral imperative to look, to know, not to hide from yourself what Hillary and other hawks in Obama cabinet have done? severed head of the 12 year old boy high in the air, joyously, is here. 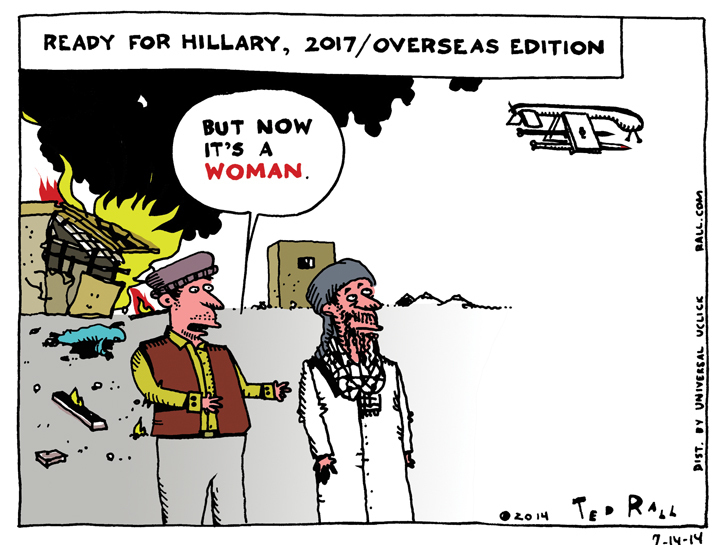 Your taxes & Hillary's foreign policy at work. 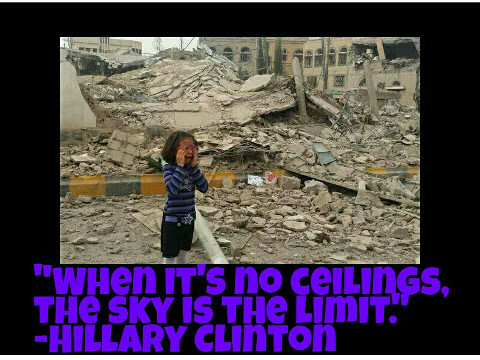 Hillary thinks the disaster in Iraq she voted to authorize, and the Libya war disaster which killed, maimed, and impoverished even more innocent civilians, women, and children, and on top of that, leaving ISIS in charge of large swathes of Libya... Hillary thinks that's not enough. 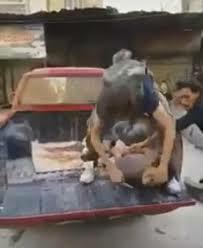 In order to overthrow the Syrian government (which at least is Secular, multi-religious acceptance and plurality, women can drive, woman Vice President, woman Speaker of Parliament, etc. And which was taking small but critical steps like legalizing opposition papers as part of a reform process long before the Arab Spring) all in order to appease the most brutal regime in the Middle East: the oil-rich Al-Saudi family dictatorship practicing and exporting the most extremist form of fundamentalism: Wahhabi Islam. All to back the oil-rich Saudis, a country where women aren't allowed to drive, or even vote outside of local elections (even that was a recent "gift" from the Al Saud family dictatorship) where bloggers like Saudi human rights activist Raif Badawi are sentenced for that "crimes" and then publicly whipped for criticizing the government, poor people who steal may have their hands cut of, people are beheaded ISIS-style after being found "guilty" in courts that international human rights observers repeatedly tell us are rigged "courts." More: Please see the section on Hillary's "special relationship" with the Saudi regime. That is, with probably the world's worst human rights abusing regime, and without question the country where women have the least rights, period. 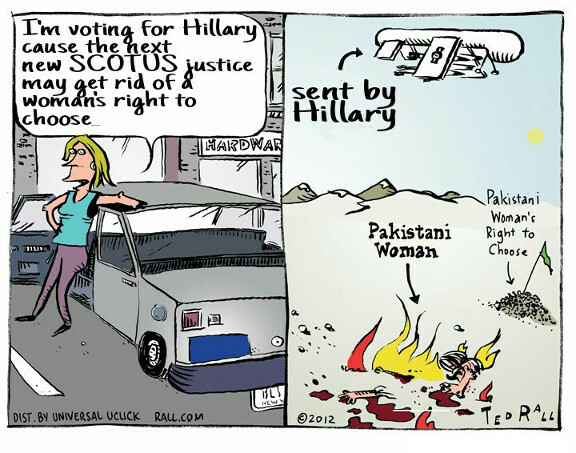 Who's done more damage to women's rights? Click the above; ignore at your own risk. → Link to articles in Washington Post and elsewhere. → Excerpts from progressive writers at Black Agenda Report, article called "Trump Way to the Left of Clinton on Foreign Policy — In Fact, He's Damn Near Anti-Empire" where we must make the same disclaimer as when right-wing Neocons complain that Trump is "to the left of Hillary" on foreign policy; in fact, the Donald is not "more to the left" of Hillary Clinton: she in her actions not just words, is well to the war-mongering Neocon Right — Hillary is well to the hard Right of Trump. 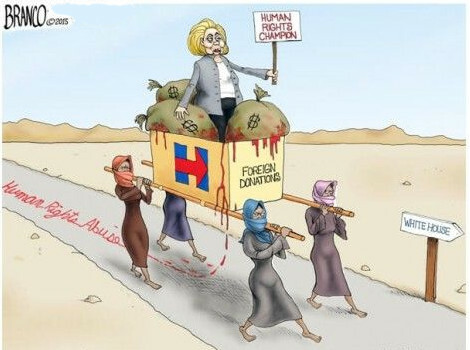 → Neocons even fund-raise for Hillary. 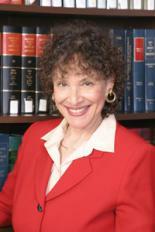 → In contrast, progressive Arab-American Sam Husseini (formerly with the progressive media watch group FAIR (Fairness and Accuracy In Reporting) quotes a foreign policy scholar on his (Husseini's) blog noting that as off the cuff as Trump has been he has at least (and unlike Hillary Clinton) indicated that talking to Russia, that is, what we would call Diplomacy, should the way forward, and the way to resolve disagreements and conflicts. By the way have you noticed the mainstream media one second fear-mongers, "Oh my God! Trump is way to fond of Russia and Putin!" then the next minute, "OMG! Trump will start a nuclear war with Putin if he (DT) wakes up on the wrong side of the bed!" (fact check: A president cannot unilaterally override everyone else and just launch nuclear war on a whim, or Reagan, Kissinger and others would have long ago) Then back to "DT loves Putin! Yuch" and "DT will start world war against Putin" and back and forth: lather, rinse, repeat. 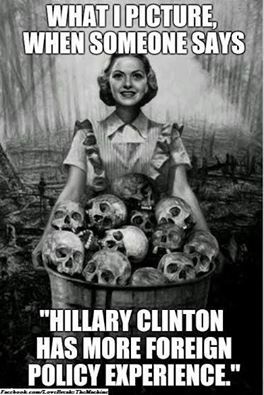 As we've been posting for a while now, Hillary not only didn't learn from her vote for the Iraq War (on-going) disaster, she pushed for a repeat "regime change" in Libya but not only that, worse yet, Hillary was the strongest war-hawk in the Obama cabinet for the Libya "regime change" catastrophe leaving still more piles of corpses of women, children, innocent Muslim civilians (those Hillary wants to "protect" from bad words by Trump she kills off in droves) but led to a Failed State with ISIS controlling much of the country. 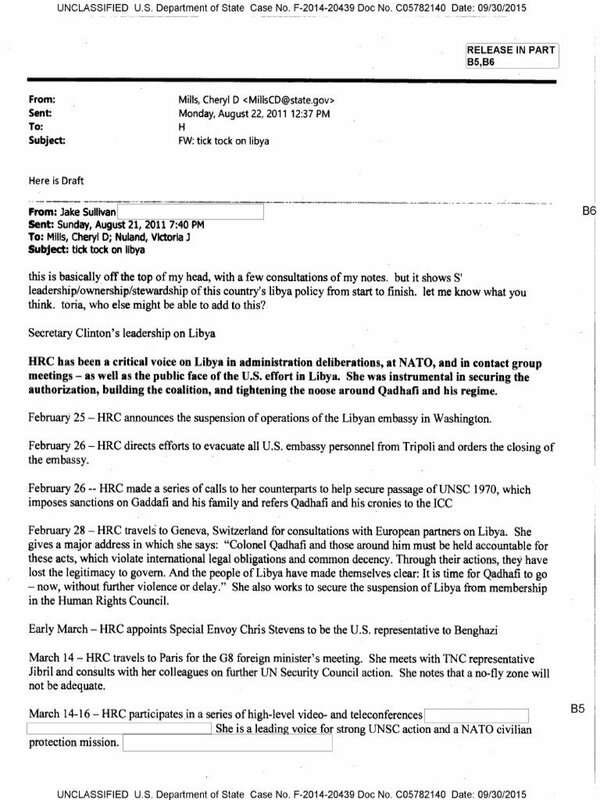 The tweet noted "According to Cheryl Mills, Hillary was the architect and leading voice for the policy that destroyed Libya" and indeed the memo shows Mills approving and forwarding to Hillary herself, a draft the latest copy of which was handed to her by Jake Sullivan for her (Mills) to review, which she does and passes on to Hillary to approve this summary of her own (Hillary's) "accomplishments" for Hillary to approve of or have modified..where they brag about the disaster they are about to unleash on Libya with another bloody "regime change" war dressed up yet again as democracy/humanitarian intervention. The post included this remarkable declassified 2011 memo shortly before the disaster which these Dr. Strangeloves created in Libya, unfolded, bragging about how Hillary owns that policy. It's even worse: Congressman Dennis Kucinich met with one of Gaddafi's sons who personally conveyed two remarkable positions of Libya leader Gaddafi: 1) expressed a willingness and even request for outside observers to freely see what was going on in Libya for themselves, to see if was jihadists and not peaceful demonstrators that the government was fighting (Remember: initially U.S. media universally mocked the idea that jihadist Islamist fighters were really present in Libya at all...much later quietly admitted, when the "fix" was in for regime change, that, yeah, armed dangerous jihadists were indeed trying to overthrow Gaddafi) and 2) the Libya government was even open to the possibility of a peaceful transition of government. 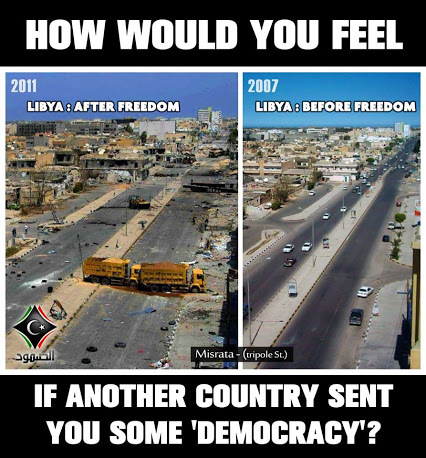 So bad as "regime change" is with the massive civilian deaths and ISIS control of much of Libya today, "regime change" wasn't even the ultimate real goal after all, since they turned down an offer for a peaceful transition. No, not any "Regime change" will do for these Cheney-like neocon warhawks led at the helm by Hillary herself: only a "regime change" that includes a "we want to be the ones installing a new government 'friendly' to our corporate (and donor?) interests, oil interests, etc" ..only that would seem to have been enough for Hillary, who could be part of identical triplets with Bush and Cheney. 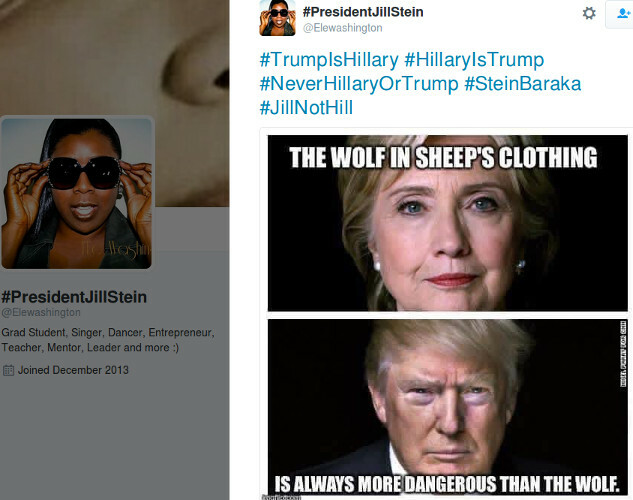 Why Hillary is a much, much bigger nucler threat than Trump by Caitlin Johnstone. Are you scared of Trump because you don’t know what he’ll do? 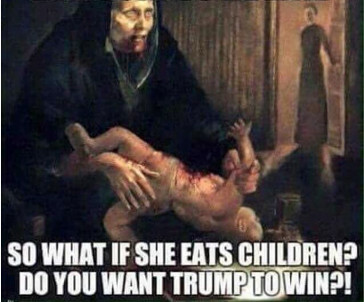 Then you should be far more scared of Clinton, because you may be certain that she’ll do unthinkably horrific things. Trump might seem unpredictable in some ways, but Hillary is predictably bloodthirsty and destructive. The “devil you know” is consistently pushing toward your worst-case scenario. How is that better, exactly?